The EU has passed a new copyright law, basically trying to protect original content creators. The way this is done, is as usual in our old world: A central point of trust is created, which then enforces the rules. Anything that will be uploaded on the internet in the future has to be licensed and anybody leveraging or using this content in their own content must gain approval to use it. Imagine you want to create a meme about a tv-show you like: you would need to get approval from that show to use their picture to then create your content. Likewise upload filters must be created for any platform where content is being uploaded, such as YouTube etc. The upload filter must be able to catch all the illegal stuff and prevent it from uploading. I don’t have a license for the tweet above and consequently what I am doing in this post would be illegal. Steem would have to prevent me from uploading this to the blockchain because this could be viewed by Europeans, even though I am sitting here in the US. Ultimately only big companies will be able to enforce this, such as google, Facebook etc. practically anyone else will have to not allow its users to upload any work. This will have a big negative effect on the internet, but I also believe it will create a great chance for blockchains. what if you are the little guy? Imagine your are a new little startup and want to built a new product where users can upload content. There is this new little world called blockchain, it lives outside of any country. You now have the choice of competing in a world that is designed for you to not be able to be competitive, or you can build your solutions on a blockchain in a decentralized Organisation in your own little world that is accessible to everyone in the world. 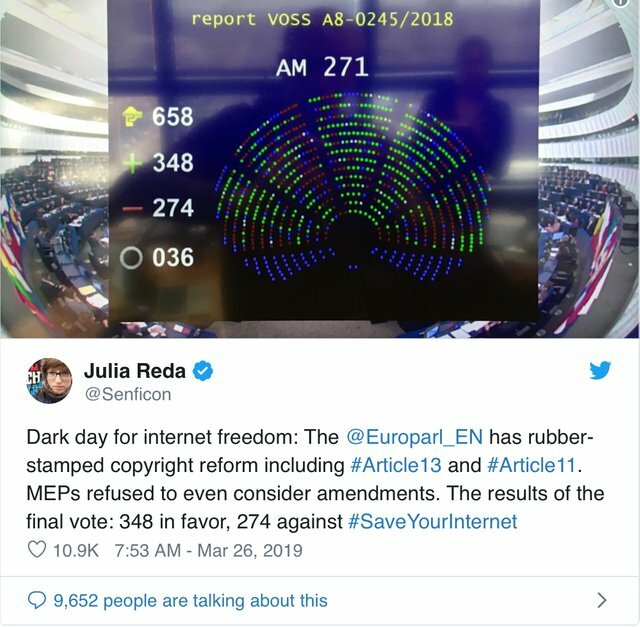 To me this law is trying to show the world and particularly the internet who is in control. The laws and rules may make sense in an old world, but do not work in this new decentralized environment that is the internet. If content is created by a few institutions and big brands, licensing may makes sense. When every kid creates stuff on their phone every day, not so much. It is a little bit of a sad day, but I think this will also create new opportunities for technologies and blockchain. These will however work with a different kind of Organisation and governance structure. I am excited about these opportunities. It really is a place for steem to prove utility. They make laws, but we already have the answer. Welcome to a world where their rules have no meaning anymore. I will be very curious to see how this plays out. As far as I heard the even want to ban links to copyrighted material since on most pages a link will already show a thumbnail or a little snippet of copyright ed information. Just crazy. Yep. What is really missing is a decentralized internet so that front ends like steemit can work effectively. I don't think you see this clearly. Even Steemit Inc can be fined now because they don't comply with EU law. This is a sad sad day. But: I think the internet is too big to be censored effectively. Yes, there will be bad news for some big companies, but I hope that the small ones will not be complying (because they are unable to) and also not be fined for not complying which effectively leaves this law useless (hopefully), just hurting youtube, facebook and a few others. If they start going after small companies with fines of 50-100k, because they are ignoring cease-and desist orders, it will be the end of the internet as we know it. Can they really risk mass insolvency due to fines which result from EU law, when we are close to (or already in) a recession? Cease-and-desist lawyers will start to work on their new playground tomorrow. Edit: Well technically the host of the content is liable. But the host of the content is.... the blockchain. It will be interesting to see, if it applies to steemit inc or not. No I see this very clearly. I agree steemit would have to censor my post. The steem blockchain would be illegal, prolly all witnessed could be fined. I see this very clearly. I think practically steemit would simply ignore the Eu market and block everyone from Europe from the site. Or they hire an upload filter from an ai company and block pretty much all content for the users from eu. Luckily such upload filters do not exist yet and will be so expensive that steemit would have to lay off 70% of staff (pun intended) to rent one for a month. I actually think this will create a market for an upload filter 3rd party. Could be that only google can provide this service. What would happen if Steemit chose not to comply and ignored any fines from the EU? Wouldn't the EU have to go through American courts first before an Anerican citizen could be arrested in America? Not sure, but probably yes. I break Chinese internet laws all the time. That doesn't mean China can come here and put me in handcuffs. Considering Steemit is based in the US, they are under no obligation to follow EU laws. Minds is taking this strategy, making it clear they are solely an American company and are under no pressure to follow the laws of nations in which they do not operate in as a company. I don't think it is that easy. Youtube and facebook will somehow have to comply to this law as well and they are also US based companies. It would be nice if some lawyer could explain this to us. You just got a 4.24% upvote from SteemPlus! @knircky You have received a 100% upvote from @botreporter because this post did not use any bidbots and you have not used bidbots in the last 30 days! I don't see how that will be enforced. The internet can't be stopped. VPN's are common knowledge among most that have been on the internet for any amount of time. Think of the money that would be needed for tracking down and charging all the "criminals" that don't follow such rules.